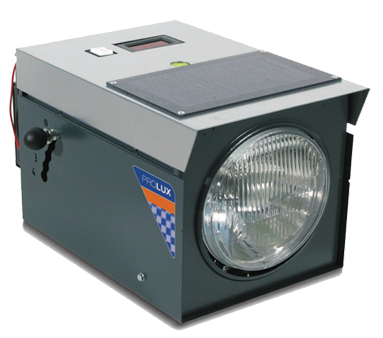 Electronic headlight with several digital luxmeter, based on wheels or rail, mirror or laser visor, printer on board. The metal box is equipped with a beam, a switch to choose for high or low beam, Voltsmeter display, adjusting pedestal, precision lever, 12V power supply cable. Unit for the periodic and occasional calibration of headlight beam testers. Equipped with a sample beam laboratory – calibrated that can be vertically set by means of a micrometric screw in a range varying from +2% to -4%. A selection switch allows to chose the low or high beam to be on; a precision lever, three adjusting feet and a cross laser allow a correct headlight beam tester's alignment.